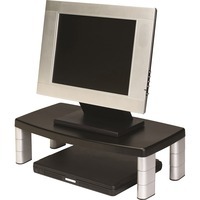 Adjustable monitor stand with nonskid base is designed for laptops, monitors and printers. Stacking columns raise the machine and allow a 16 wide storage space underneath to maximize desk space. The extra wide monitor raises the monitor from 78 to 5 78 in increments of 1 58 to help ensure the proper viewing angle. It is great for laptops, printers or monitors up to 17 or 40 lb.